-Read the media bias example below (from a post by Geoffrey Dickens at mrc.org). In the past couple of months there was bad news for ObamaCare, but you wouldn’t have heard it if you only get your news from the Big Three (ABC, CBS, NBC) networks. From a Society of Actuaries report that determined premium costs will shoot up thanks to a 33% average increase in claims; to 33 Senate Democrats joining Republicans in voting to repeal an ObamaCare tax on medical devices; to a Quinnipiac University poll showing even two-thirds of self-identified Democrats saying the law will either hurt them or have no effect, the recent news has been bad for the President’s chief legislative victory. However, not one of these trouble spots for ObamaCare has been mentioned on ABC, CBS or NBC’s evening or morning show broadcasts. Big Three (ABC, CBS, NBC) coverage: 0 stories. On March 26, the Society of Actuaries, released a study that determined health claims will increase by an average of 32 percent with some states seeing claims rise as much as 80 percent. The study estimated that states will now have to double their health spending to cover the millions of the previously uninsured. The study went on to report that claims will be driven higher because many employers will stop covering their employees once Obamacare is instituted and those workers will be more expensive to insure than those already in the individual market. Big Three coverage: 0 stories. On April 4 Quinnipiac University released a poll showing that even two-thirds of Democrats now believe Obama’s health care reforms will either hurt them personally or have no effect on their daily lives, vs. 27% of Democrats who believed they would be helped. Overall, only 15% of voters think ObamaCare will mostly help them personally, vs. 78% who expect it to hurt them or have no effect. 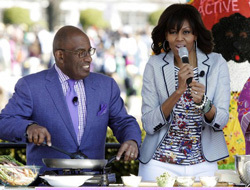 NBC’s April 2 Today show highlighted a clip of Al Roker singing “Put a Little Love in Your Heart” with Michelle Obama and celebrity chef Anne Burrell at the White House Easter Egg Roll. 1. What 2 types of bias does this post highlight? 2. Why do you think the 3 network news stations chose not to report these newsworthy stories? 1. Bias by omission and story selection.